Now, adventuring is tricky business, when you get down to it. Oh sure, there might be riches and fame at the end of it all, but you need to be prepared. You may be facing deadly traps (in which case you'll need to hone your jump skills), and you might be attacked by vicious beasts (so you'll need to pack a weapon - like a boomerang, for instance). It's complicated work, and there's no wonder that most adventurers never even get started. And then we have Bob. Bob knows the value of simplicity. Bob doesn't need multiple buttons for "jumping," "attacking," or anything like that: No, Bob goes adventuring just packing his trusty Left Mouse Button. What does the LMB do, you ask? It does everything, depending on the situation. Need to jump over a chasm? Yeah, it does that. Need to climb up a ladder before you run into a bomb? It does that too. And it goes without saying that it throws a boomerang at spiders and bats lurking in front of you, of course. 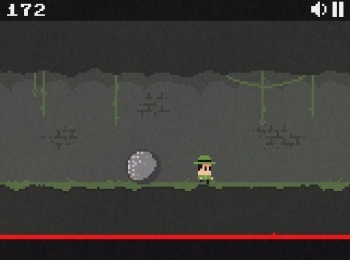 The Adventures of One-Button Bob is very simple, addictive game design at its finest. It's remarkably intuitive, fun to figure out even when you fail, and has a brilliantly catchy soundtrack. Help Bob through his adventures by click-click-clicking away, get the treasure, and then realize your life is empty, for you have no Left Mouse Button of your own in your life. But you do have a fun browser game, so maybe it makes up for it.